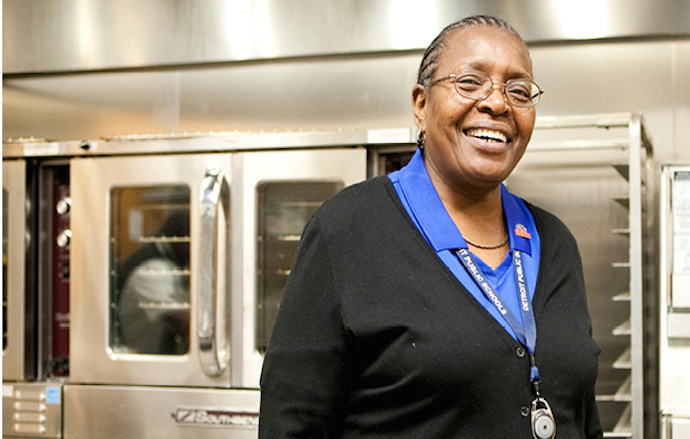 Betti Wiggins has had a long and illustrious history as a nutrition and food service management professional. Beginning her career in hospitals and health care, she was one of the first African-Americans recruited to management in the Marriott Corporation’s Division of School Services in 1989. Currently, she is the executive director of the Office of School Nutrition for Detroit Public Schools. She is responsible for school-based meal operations in 143 schools for all USDA child nutrition programs and non-program sales, facilities management, employees, and services; training programs for all levels of staff, and managing external business relationships with vendors, school principals, and non-profit organizations. In 2011, under her leadership, the Detroit School Garden Collaborative was established which currently supports 76 school-based gardens and a 4.5 acre school farm. In addition to Detroit, Wiggins has worked in school districts in Washington D.C., Baltimore, Atlanta,Paterson, New Jersey, and Ann Arbor. In the private sector, she has consulted on ensuring quality service, operational accountability, and compliance with levels of the law. Wiggins has a nutrition degree from Wayne State University, pursued graduate studies at the University of Minnesota, and has a municipal management certificate from George Washington University. Wiggins was awarded the 1997 Silver Medalist Certificate of Achievement from the Federal Executive Board: Excellence in Government,amongst other honors. Recently, she delivered a rousing testimony on the subject of feeding America's children at the Congressional hearing before the Committee on Agriculture, Nutrition and Forestry of the U.S. Senate.